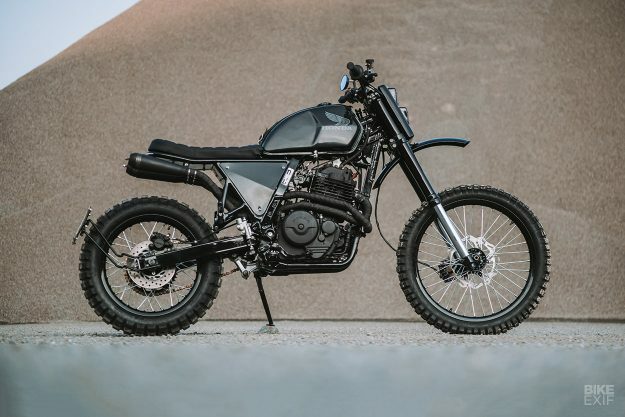 The Honda NX 650 Dominator is one of the custom scene’s greatest sleepers. It’s not the most prolific donor, but it’s loaded with potential. 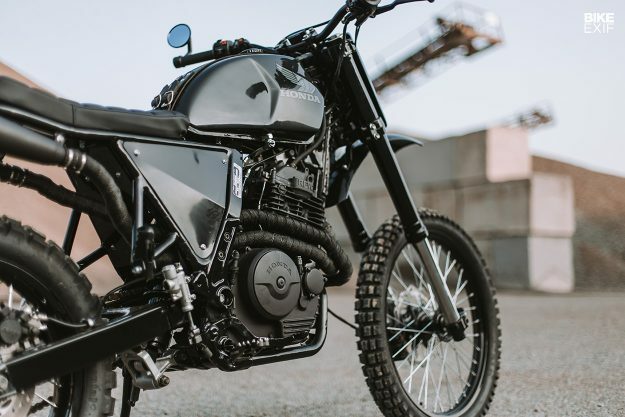 Even in stock form it has tons of 90s adventure bike charm—and if you tweak it just right, you’ll end up with a killer scrambler. 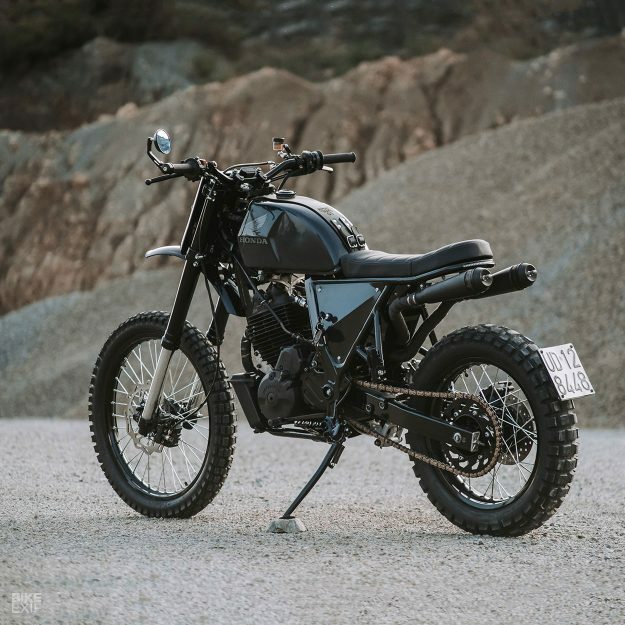 At first glance, this Italian-built Dommie looks like a rough-hewn weekend thrasher. Look past the murdered-out paint job though, and you’ll find a slew of tasteful changes. Tommaso’s client wanted a scrambler with some 70s dirt bike influence. After some deliberation, they settled on the Dominator—so Tommaso sourced a good condition example, and brought it back to the den. There, he and his friend Edoardo set to work. Given the state of the donor, the guys didn’t have to crack open the motor. But they did bin all the bodywork, so that they could start fresh. 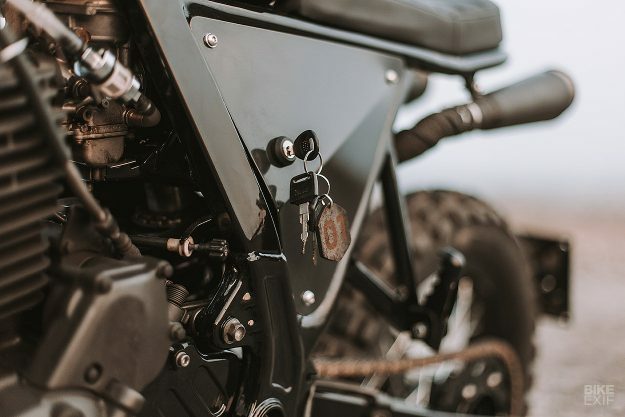 On went the fuel tank from a 1971 KTM 125 cc dirt bike, held in place by a custom-made leather tank strap bearing the A&G logo. The strap is all that’s holding the tank down, and had to be attached via custom-made mounting brackets, welded to the frame. Out back, Tommaso and Edoardo edited the subframe, finishing it off with an LED strip that handles both taillight and turn signal duties. There’s a custom-made saddle up top, and a pair of hand-made side panels to round out the design. Underneath the seat, the team ditched the airbox for a pod filter. They also re-did all the wiring, tucking the battery and a bunch of other components up under the seat. The Dominator’s new headlight shroud proved to be a tricky piece to execute, and it took several tries before the final fiberglass part was ready. 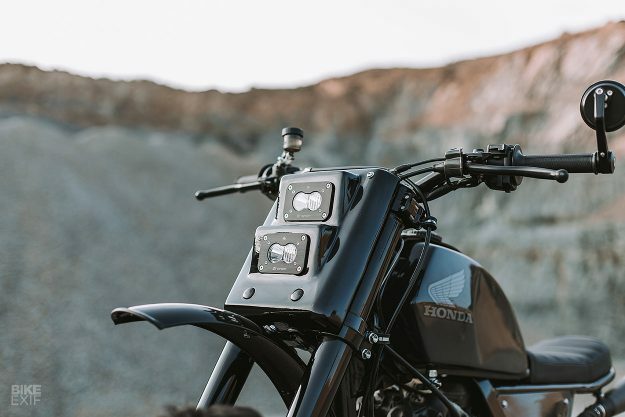 It houses two powerful Baja Designs LED headlights, and a pair of turn signals. 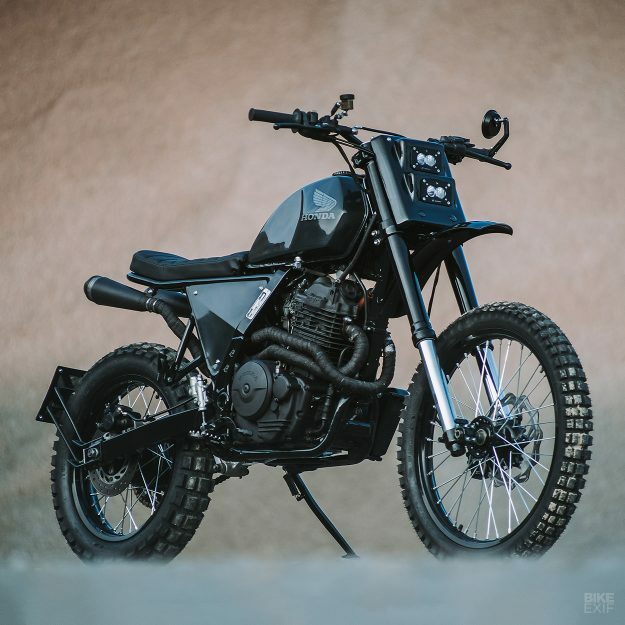 The guys also grafted on upside-down forks and a new front wheel, lifted off a modern scrambler, and overhauled the rear shock. Both rims and the fork legs were anodized black, and the wheels were wrapped in chunky Continental TKC80 tires. The front brake disc was replaced, the master cylinders at both ends were upgraded to Brembo items, and the brake lines replaced. There are a bunch of subtle touches that give this Dominator a really sorted feel. A&G have seen to the minutiae; installing new cable guides and adding an inline fuel filter. But they’ve also mixed in some great visual hits, like those vintage Supertrapp cans, courtesy of eBay. 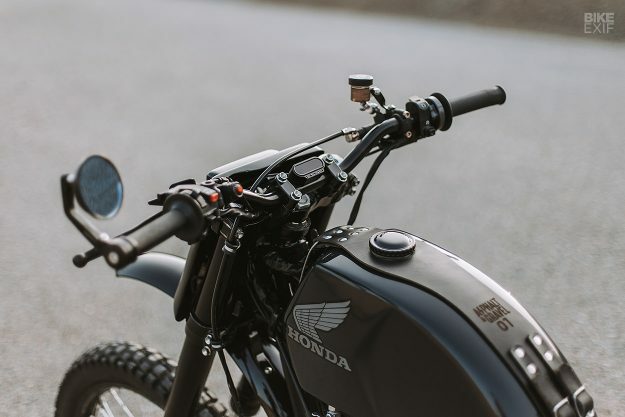 The front fender is a generic item that Tommaso cut to length (he cites his lack of an English wheel as his reason for not rolling his own), while the rear plate bracket is a hand-made piece. 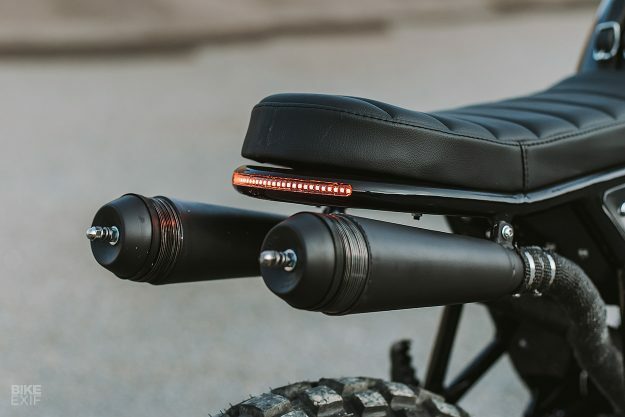 Other small changes include grippy Accossato foot pegs, Tarozzi passenger pegs, Magura grips and a single bar-end mirror. The Dominator’s bulky dashboard is gone, replaced by a tiny digital Motogadget unit, mounted just off the bars. And the ignition’s been moved to the side of the bike, to clean the cockpit up even more. Even though #AG01’s livery is hardly in-your-face, it involved a lot of thought. The customer wanted a ‘very dark’ bike, but not completely black. So the frame, motor and a bunch of other mechanical components were finished in black, while the bodywork was painted a dark grey. Matteo Murgia did a stellar job executing the paint job. 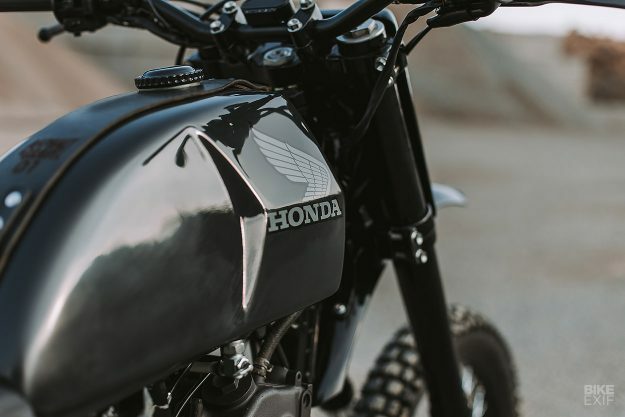 He even added light grey, period-correct Honda logos to the tank—giving the bike more of an OEM vibe. 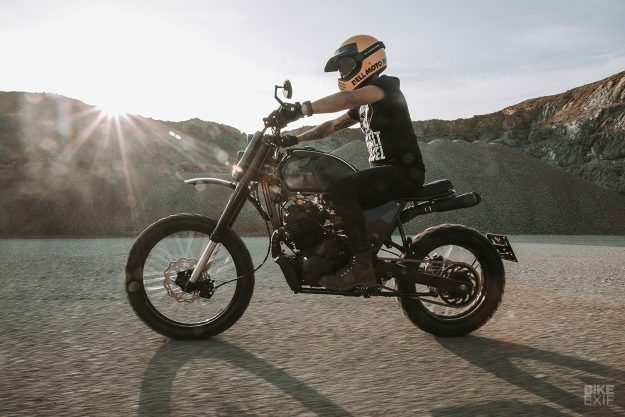 With Asphalt and Gravel’s Dominator all buttoned up and ready for delivery, there was only one thing left to do: drag it into the quarry for its glamor shoot. Looks like it would be a total blast to hammer around on, doesn’t it?